Happy Christmas everyone: a day late. When you're young, things happen to you. You make decisions, but they are all very carefully controlled. When you get older, you make decisions, but they don't have much consequence, for the most part: there's a lot you can recover from. When you get to the next stage, things start to matter more. I'm at that stage now, where things really start to matter. Christmas makes these decisions sort of clear, particularly the more aware the kids become. Naomi is old enough to start remembering things and the decisions we make about Christmas are starting to become important. What do I think about Santa? What do I think about how much the kids should get? Are we going to do the American, Japanese, or UK Christmas? What traditions matter, which ones don't? How much do we want to spend on presents, what do we want to teach the kids about getting presents and giving them? I have answers for none of those questions and like everything else related to my family life, I feel like I am falling into the answers. The kids got simple presents. We spent about £30 on each of them. That seems about right at this stage. All of their grandparents gave them stuff. The doll house is a huge success. Naomi's been wearing the dress-up costume she got for the last two days straight. We ate a lot, but not a lot of sweets. Yoko told the kids that we were celebrating Jesus' birthday and then set out an apple with a bite taken out of it and a cup of half-drank tea to show the kids that Santa had come. I just watched, more passive than I would like to be, I suppose. I don't have an opinion about it: I don't know if I need one. I'm much more concerned with the micro things of their behaviour than the macro things of belief. Picking up your coat, saying please and thank you, not climbing on the chairs. Belief is such a heavy thing for a child: I think this is the deepest and more ardent rebellion I have in me about my own upbringing. Let them come to belief on their own--I want to give them safe agnosticism and reason, not belief. And Santa, as silly as it seems, smacks of teaching faith despite reason. How awful is that. What an awful thing to say. And still, I did say on at least one occasion, if you don't behave, Santa won't come. How pernicious is that. Still not able to balance belief and action. My headphones came, which are just about the best gift I could receive (from my parents and famed older brother and sister-in-law). My medicine bag came in the same box, but I kept correcting people: it's not a Christmas gift, I bought it for myself. I don't know why I insisted on saying that. Trying to not present myself as selfish? Trying to emphasise the fact that I had the money to buy it myself? I don't know — anyway, it doesn't matter. Now, I can be a doctor. Well, after my smashing success from last year, I decided to go again. Let's see how I do! Ron Paul win in Iowa for naught. Romney wins nomination quickly, loses by McCain margins to Obama. Death of Pope. New Pope: younger, Latino. Israel bombs Iran, everybody sort of forgets about it. I think I've got some winners here! Is it late enough in the year to generalise about it? 26 June, I suppose that is the most important day of the year: Mia's birthday. But I have blogged about this. The rest of the year feels like a haze of avoiding food and feeling uneasy. I'm exhausted. I think I can say that. I'm exhausted. This year has been exhausting: my (our) own fault really. When you decide to live abroad, away from your family, you build into your life the stress of not having any support. But I have blogged about this. Can I put the highlights of the year together? What I remember? There are things I always want to say here that I can't, I shouldn't, for various reasons. I live my life too publicly, I don't hold enough close to me. I have, of course, already blogged about this. 2011: The year I stopped sitting down and sleeping? Maybe. The year I wrote and wrote and wrote. How about that? The year I gave up my evolutionary purpose. 2011: The healthiest year ever/ the most unhealthy year ever. The year I realised I can weigh whatever the hell I want and I probably shouldn't try to be what I idealise. 2011: I travelled to the US twice, to Spain, Turkey, Germany, Wales... Not bad. I can't find my new year's resolutions, but one was about weight (which I kept in theory: the resolution hadn't accounted for fat rather than muscle). Something about being a better person towards my wife and kids. I think I did marginally better there. 2012: I will run a marathon, become a doctor and turn 30. That's enough. No more kids. A likely move, potentially International. I assume that I will just write and write and write. I want an image from this year. Something to describe it all in one flew swoop. It's not coming to me. I will clean up my desk now, pack things up and maybe walk home instead of riding my bike. That sounds about right. My saddleback bag will be here soon. Marathon training starts tomorrow (sort of) and I finally caved and bought new shoes. The barefoot thing isn't going to happen when it's just around zero degrees all January and I had put two years of hard running into my other pair. Are my new shoes pink? Yes. Were they on sale? Yes. Weren't there other ones on sale that weren't pink? Yes. 80 minutes tomorrow. Going to count minutes, not miles, to train. Less planning, less thinking. Run 40 minutes one way, run back. Run 50 minutes one way, run back. Run an hour and half one way, run back. I woke up this morning and it was snowing for the first time: Bon hiver, I thought. Christopher Hitchens has died. I wanted to cry when I heard: I don't know why. Christopher Hitchens is the sort of atheist I dislike, but the kind of writer I admire: the man's man of writers. Of course, we all knew he was dying. I assumed it would happen and was surprised that it ultimately took so long. Still. Christopher Hitchens is dead. This week has been extremely difficult, but in the way that you feel stronger having overcome it. My supervisor and I met on Wednesday, and something has happened in our relationship that I can't pinpoint, but has made things remarkably easier. She is really an incredible teacher. So much more to do, so much more to rewrite, rework, rethink, but her investment in the project, in me as an academic, gives me an immense amount of strength. I've been listening to some of Pitchfork's 50 albums of the year: amazing that we live in a time when we can do this. All music is free and legal? If it's not putting you out of business, it's great. Youth Lagoon's 'The Year of Hibernation' now. Wow. I have another hint of convergence as I finally am writing up my analysis in the way my supervisors want. I see where it is going. This could very well be done in 8 months. I could very well be a doctor by the end of next year. Should that surprise me? It shouldn't. I also need some New Year's resolutions. Running the marathon and doing the PhD should be enough. We'll see if there's anything else. Last night I got my medicine bag. I wasn't expecting to, actually: I had made what I thought was a low-ball bid on a bag that looks to be about two and half years old. There was no shipping cost on it, so I thought it would surely go up. I went to sleep with two and half hours left and I was the high bidder, but I was at my limit, so I assumed that it would go over at the end. It didn't. I woke up and I had won. I've been awfully materialistic the last three weeks about this thing: I'm sorry about that, I really am. Watch me make this about something bigger, about growing up and getting wiser and being strong and not just about me getting something I want-stroke-need. Watch me blow it out of proportion. I've spent all day, every day for the last three plus years thinking about heavy things, professionally and personally. My twenty plus year faith under the microscope, if I'm honest about what I've been doing. I do that all day, trying to make something out of nothing with so little to show for it at this point (this will change by this time next year). And then I've gone home and done my best to care for the wife and kids, but I'm so bad at it: every time I think I have gotten better, I get angry, I make one of my kids cry. They go to bed and 10-15 days out of the month, I go back to work: marking essays or my thesis. It's this never-ending cycle of Maoist self criticism. Ein Hungerkünstler: the hunger artist. Thinking about this bag has given me this little oasis in my life. Something to think about that has had no consequence: everything else in my life has been full of consequences. I said to my colleague who's just about to finish her PhD this week: no one knows what you've done in the last three years except you. Only you know how hard it was. How strong you are, how you've overcome what you've overcome. This bag, to me, embodies that: it's a symbol, a metaphor for strength. 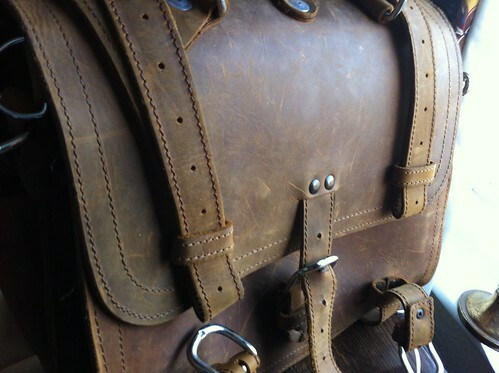 Saddleback bags are heavy and get better as they scar and mature. A five year-old Saddleback bag has a story: it's not slick or elegant, but it doesn't need to be because it came by its maturity honestly. The marks and scars, the ageing of the leather, make it better and better and better. I bought this bag with my own money: nobody paid for it for me (a metaphor--don't miss the metaphor). Like my tattoo, Resurgam: it's not perfect, but it's imperfection makes it... just that. It makes it. I'm such an evangelist at heart. The bag looks to be in good shape, the colour I wanted, a colour they don't actually offer any more. The good thing, I realised about a bag that's a couple of years old (in addition to it being about 60% of the new cost), is that you can see how the leather is going to age. What it's going to look like in the long term. If I were to get a new one, there's some mystery about what it will look like in a couple of years (although probably never bad). No question about that now with an older bag. It has suede lining rather than pigskin, making it softer inside, from what I can tell. You can tell it's a bit older based on where the front rivets are and the front buckle, but still: 100 year warranty (minus 2-3 years). So I have been successful in acquiring something that I will use everyday for... well, awhile. Pending actually seeing the bag, I am pretty damn excited. I'll put the pictures of it up when I get it (the auction ones were lousy): I might be able to get it before Christmas, but not likely. Probably the 28th or 29th. That's okay. I have the rest of my life. I promise to stop talking about the bag eventually, don't worry. Making everything material in my life a metaphor for everything immaterial? Well, that is probably not ever going to change. All experience is, after all, embodied. Yes, I am passively choosing insomnia at this point. Sleep? There's too much going on to sleep. I want to be awake. So I was cat-napping on the train, and this thought occurred to me: It could all just work out. It's not that crazy actually. All the visa news I've heard is to my favour. The bid at Lancaster could go through. The thesis is on track and being on track with less than a year to go, almost half of a year, is a good sign. We could be in the States for Christmas next year, I thought. I shouldn't be so surprised. I had a dream last night that I got in an elevator and pressed down, but the elevator wouldn't go down. It went up instead, to the top floor of a building where no one was. I stepped out of the elevator and suddenly I sensed that everything was ending. It was that moment in a dream when you start to realise that a dream is just a dream, but the end of the dream came before the realisation: I didn't realise I was dreaming until I sat up, fully awake. In the dream, my vision suddenly looked like a failing computer monitor and I thought, I'm dying.